Long-strained Sino-Japanese relations might have entered a “new historic phase”, as Japan’s Prime Minister Abe Shinzo and China’s President Xi Jinping expressed their shared willingness to transform the dynamics of bilateral relations “from competition to collaboration” during the official meeting in Beijing on October 26, 2018. On the same day, Abe Shinzo and Chinese Prime Minister Li Keqiang outlined a package of business deals and vowed to continue unconditional development of mutual cooperation. While the economic settlement comes amid trade tensions with Washington, it would be premature to expect China-Japan rapprochement to go beyond a short-term commitment and bring any major breakthroughs. The summit has, however, given a fresh impetus to settle lingering Sino-Japanese frictions, as both sides set aside political differences to uncover their common motivation for an alternative economic partnership. Such an approach might be key for overcoming mutual hostility and distrust in often-fraught relations between the world’s second- and third-largest economies. The Abe-Xi mutual commitment to maintain stable relations demonstrates an encouraging strategy in terms of Northeast Asia’s pattern of conflict and cooperation, particularly between Japan and South Korea. Abe’s historic visit to Beijing, the first official visit of a Japanese leader to China in nearly seven years, took place after years of tensions over long-standing historical grievances, competing maritime sovereignty claims, and geopolitical rivalry in the wake of China’s rapid ascendancy in the region since 2010. Despite flourishing bilateral trade and investment, diplomatic strains intensified in 2012, following Japan’s purchase of the uninhabited Senkaku/Diaoyu islets in the East China Sea, claimed by Beijing and controlled by Tokyo. In 2013, Chinese officials labelled Abe as an “unwelcomed person”, shortly after the Japanese leader paid visit to Tokyo’s Yasukuni shrine that honors the estimated 2.5 million Japanese who died during the war, including those 14 found guilty by Allied war tribunals of committing A-class war crimes. Yet the situation has changed recently and Abe’s historic visit to Beijing marked the 40th anniversary of the Japan-China Peace and Friendship Treaty, signed on August 12, 1978. Increasing disarray and trade protectionism within U.S. foreign policy have pushed Asia’s strategic rivals into becoming partners of choice, thus creating a constructive, future-oriented framework for countering enduring strains. 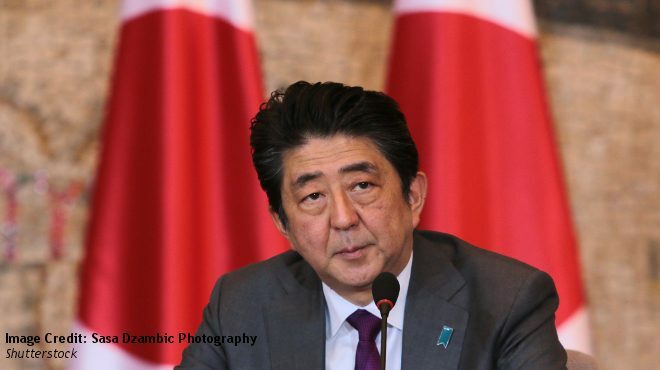 At the time of Abe’s growing unease over the decline of U.S. regional presence, China has turned to Japan in order to alleviate the impact of the tariff war with President Trump. While problems have not disappeared and no one expects any major Sino-Japanese reconciliation, this might eventually prove a reasonable strategy for establishing a cooperative environment and articulating a motive for bilateral improvement, in contrast to recurring deterioration. At the same time, contentious Japan-South Korea relations continue to face disruptions to bilateral ties and mutual diplomatic credibility, despite recent developments in the North Korea dialogue. In terms of security, Japan and South Korea have long been of critical importance to one another, however, bilateral ties between Tokyo and Seoul remain infamously poor. On October 22, 2018, a cross-party group of 13 South Korean lawmakers landed on the Japan-claimed, South Korea-controlled islets in the South China Sea, known as Takeshima/Dokdo respectively, in defiance of the Japanese sovereignty claim. Earlier, Japan’s Maritime Self-Defense Force (MSDF) vessel skipped the international fleet review held at Jeju Island in South Korea due to Seoul’s request not to display MSDF’s Rising Sun flag, seen by many South Koreans as a controversial symbol of Japanese imperialism and colonization. Incapable of engaging in a meaningful dialogue, Japan-South Korea relations continue to be at odds due to historical grievances, competing sovereignty claims, and South Korea’s domestic circumstances, — which are entangled in anti-Japanese sentiments. Reconciliation efforts in Northeast Asia do not seem to come near a groundbreaking progress, being commonly defined as contentious rather than cooperative. For Japan and South Korea, the question should not be how to improve staggering bilateral relations or bring about larger cooperation, considering the realistic outlook on the extent of a conceivable rapprochement. Rather, the key would be in asking what common motives or third-party ties the two states share in the region, as those would constitute a platform for a consistent high-level engagement between Tokyo and Seoul. For decades, strategic considerations would allow for the Japanese-South Korean habit of cooperativeness, despite conflict-ridden history and territorial claims. However, once the awareness of a shared strategic discourse and mutual benefit has dissipated, the relationship circled back to distrust. There will always be areas of divergence, and a rational foreign strategy calls not primarily for a reconciliation dialogue, but a continuous effort to consolidate the existent relationship around common motivations, relatable to domestic circumstances and constituencies. Increasing interaction and solidifying trust would open more communication channels for expressing the countries’ respective positions on long-standing disputes. October 8, 2018, marked the 20th anniversary of the Japan-South Korea declaration to “squarely face the past and develop relations based on mutual understanding and trust”. Three weeks later, October 30, South Korea’s Supreme Court ordered a Japanese steel firm to compensate four South Koreans who were victims of forced labor during Japan’s colonial rule of the Korean Peninsula in 1910-1945. Unless Abe and South Korea’s President Moon Jae-in take active steps in reinforcing future-oriented bonds and work on resolving structural problems in the bilateral ties, the relations will go from bad to worse. In this regard, the Sino-Japanese economic rapprochement has offered an exemplary approach to cooperation, amid speculation about President Xi’s planned reciprocal visit during next year’s G20 summit of developed and emerging economies to be hosted in Osaka, Japan. Since economic considerations commonly facilitate historic reconciliation, joint commitment to institutionalizing trilateral economic integration could be an important boost for a renewed diplomatic engagement across the region, including the extremely volatile ties between Tokyo and Seoul.